The picture featured above is a first for the starfish team – a cake with one of their web sites on it! The design pictured is the new ColdFusion User Group of WA web site. Kay and Dave have been long time members and supporters of CFUGWA – right from it’s inception, way back in 2001 or so – so when user group manager Andrew Mercer announced a site redesign competition, we put Levi to work to come up with something cool. Then, Al took Levi’s design and wove some HTML/CSS magic. Put to a vote of the members, the resulting prototype just edged out a very strong competitor to win the prize, an Adobe software package of our choice. 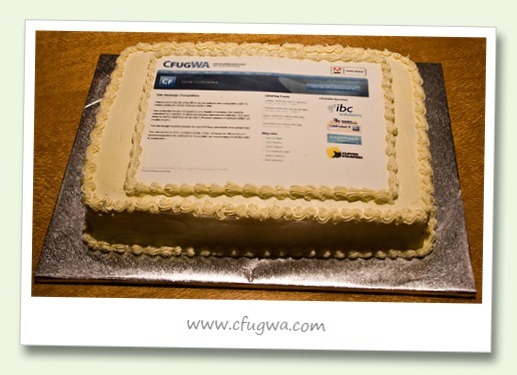 We launched in style with the cake, at a special meeting of the CFUG at Curtin university last Tuesday. The site is powered by YourSite, the ColdFusion-based CMS/hosting solution from fellow CFUGWA member Brett Payne-Rhodes. We think it’s one of the best-looking CF user group sites around, but we might be just a little bit biased!